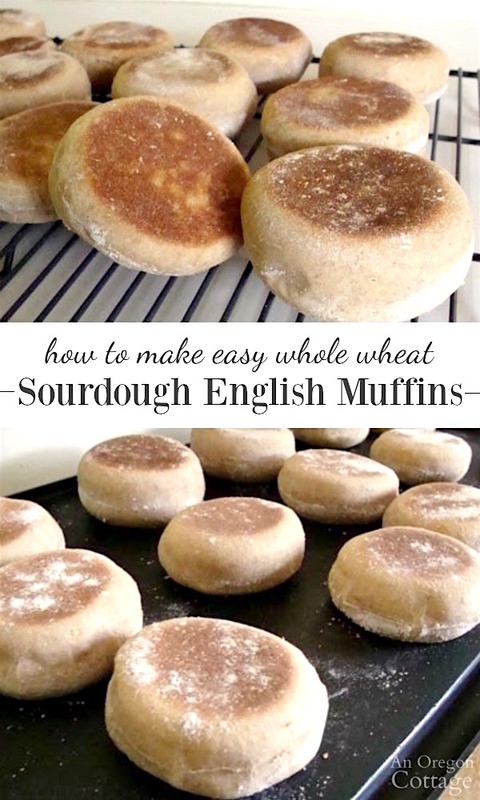 These whole wheat sourdough english muffins are surprisingly easy to make – and the taste is so far above store bought that it’s worth the effort. This recipe is one of our Best Bread Recipes–head over to the page to find more! 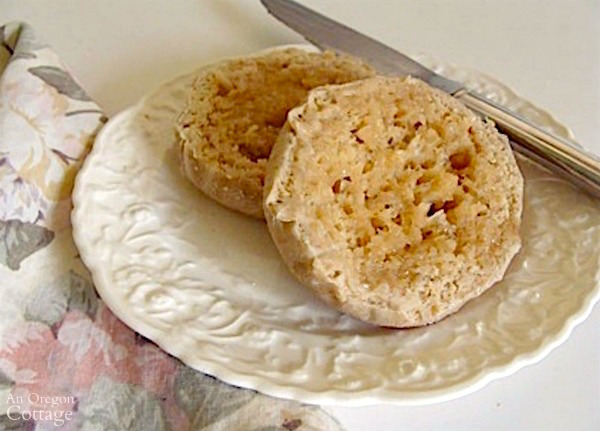 English muffins are one of those things that, up until a few years ago, it would have never crossed my mind to make (like so many other pantry basics I discovered were easy). I don’t know…when you don’t grow up around bread making and homemade stuff, it’s easy just to think it can’t be made at home. Which seems silly, because I knew it was possible to make bread, even if I didn’t know anyone who did. Oh, but have I learned they can be made at home, AND they taste incredible (Promise! I’m not just saying that because I make them), AND they are really easy. And when you add whole wheat and sourdough into the equation? L.o.v.e. The only thing that’s hard about this recipe is to remember to start the night before. I’ve been known to make a big note and leave it on my bed to remind me I can’t climb in until I’ve mixed up the initial dough! Do what you need to do to make it happen, though – you won’t be sorry. 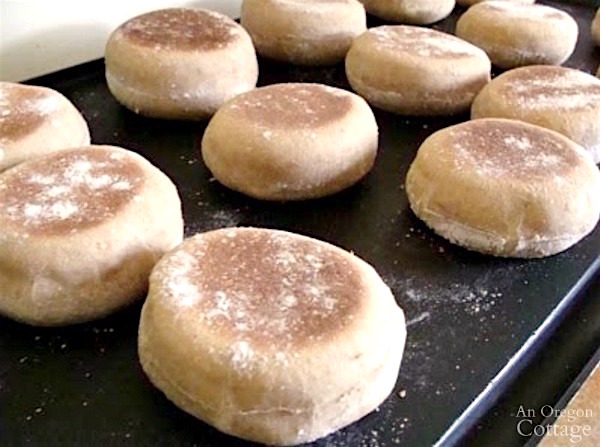 Here’s all the steps you need to follow to make your own fresh-off-the-griddle English muffins. 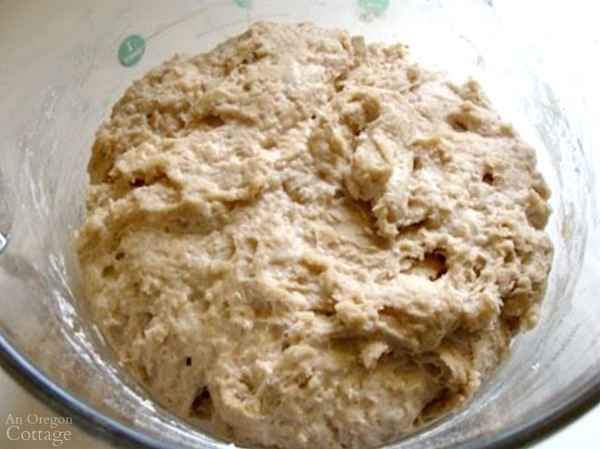 Take five minutes the night before to mix the sourdough starter with a bit of honey, flour, and milk. Water will work if you’re avoiding dairy, but they won’t be quite as tender. In the morning, it will look like the photo above (or it may have risen higher, depending on your starter, the temperature, how active your starter is, etc.). Go with whatever yours looks like. I’ve found English muffins, thankfully, to pretty forgiving. 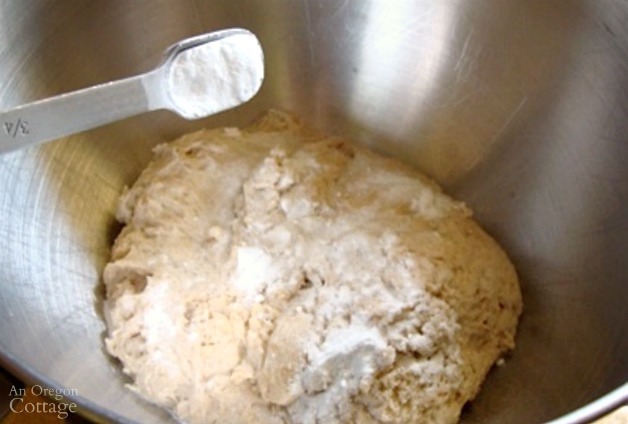 Transfer the dough to the bowl of a stand mixer or a large mixing bowl if stirring by hand. Add baking soda, salt, and 1/4 cup flour to the dough and mix together. 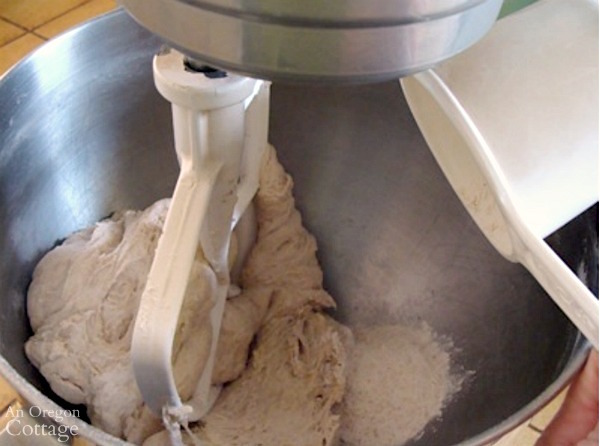 Knead with the mixer (or by hand) for 3-4 minutes, adding another 1/4-1/3 cup of flour gradually (1-2 tablespoons at a time) during the kneading process. 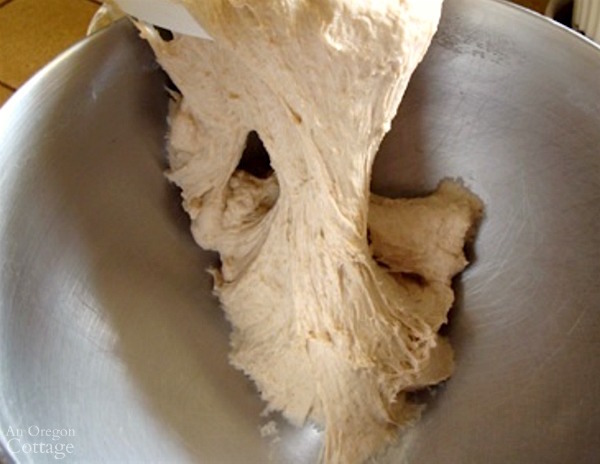 When the 1/4 c. of flour has been added, the dough should be moist enough to stick to the bowl, but only be a bit tacky when touched with a finger. If a lot sticks to your finger that’s how you know to add more flour, but no more than 1/3 cup total, as stated in the recipe. I’ve found that the enemy of any bread is too much flour– it’s best for the dough to need to be scraped out of a bowl, like shown above. 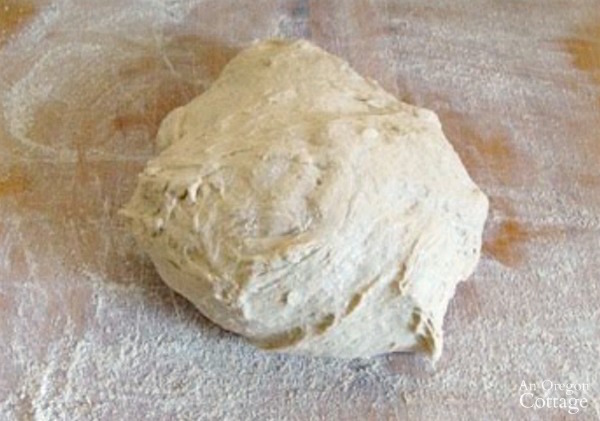 Turn the dough out onto a floured surface and knead it into a round. 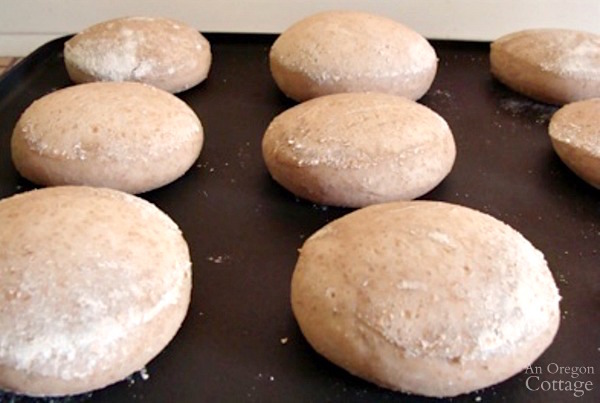 Use a rolling pin to roll the dough to about 1/2- inch thickness. 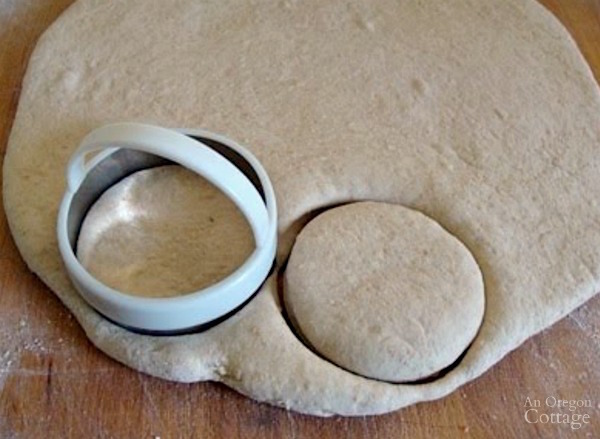 Cut the dough into rounds using a 3-inch biscuit cutter…or anything that will produce uniform rounds. I like using biscuit cutters- there are recipes I saw that require you to shape each muffin with your hands- who has time for that? It’s OK to gather the dough and re-roll to cut more muffins- I haven’t noticed any difference between the first roll and the second. I take the little scrap from the last bit and hand-shape it into a cute little muffin. No waste here. 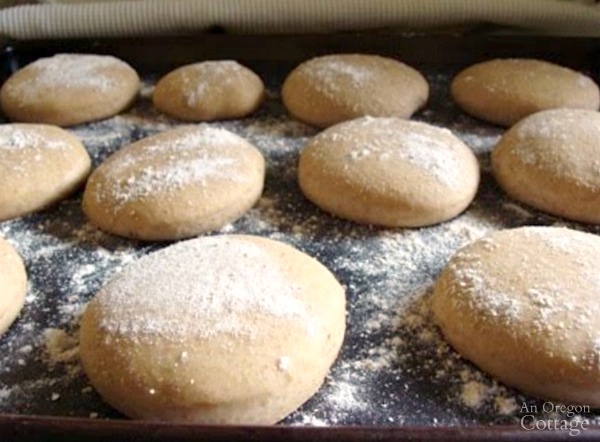 Set the rounds on a lined baking sheet (parchment or silicone) that has been dusted with cornmeal or a bit of flour. Don’t let them touch as they will stick together, but an inch or two apart is fine. Dust the tops with a bit more cornmeal or flour. Cover with a towel and set in a warm place to rise for a couple of hours. I’ve cooked these after letting them rise only one hour and they were fine, but the holes inside are bigger after the full 2 hour rise. The picture you see above is after a 2-hour rise and you can see that they actually don’t rise all that much- just puff a bit. They will rise more when cooked. Heat a griddle to a medium-low setting (about 275 degrees) so the muffins have time to cook inside without burning on the outside. Tip: The muffins do tend to stick to the lining even with a dusting of flour/cornmeal, so as you slide a spatula under to transfer to the griddle, pick up a bit of the flour/cornmeal as you’re lifting the muffin with the spatula. Then invert onto the heated griddle. Cook on one side about 4 minutes, or until browned. You can see above how they puff during the initial cooking. 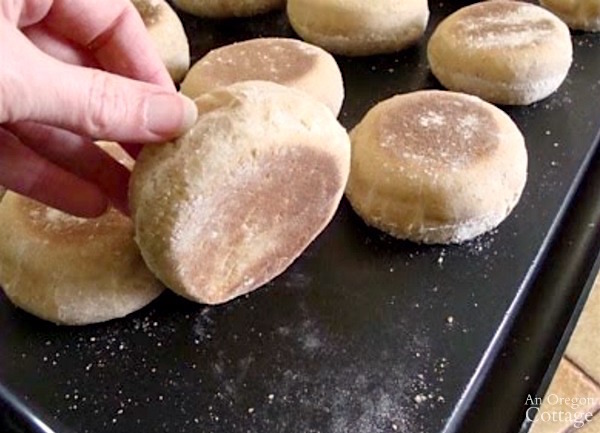 Turn and flatten slightly with the back of the spatula to get that characteristic English muffin shape. Cook for about another 4 minutes, looking to make sure the muffin is browned on the bottom. Remove to a baking rack to cool. 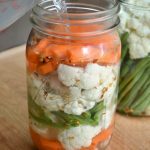 Keep for a day or two in a sealed container or freeze for longer storage. Slice, toast, and butter like you would any English muffin. Just be prepared for a major taste difference! And that’s it- one quick mix the night before, another stir in a mixer, a simple roll-and-cut, a rise and a super-quick eight minute cook. I think it might be 20-25 minutes total hands-on time. Not too bad for a dozen great tasting fresh English muffins that cost about $1.00. Oh, and our family’s favorite way to eat these is as a base for Eggs Benedict with super easy Hollandaise sauce – yum. 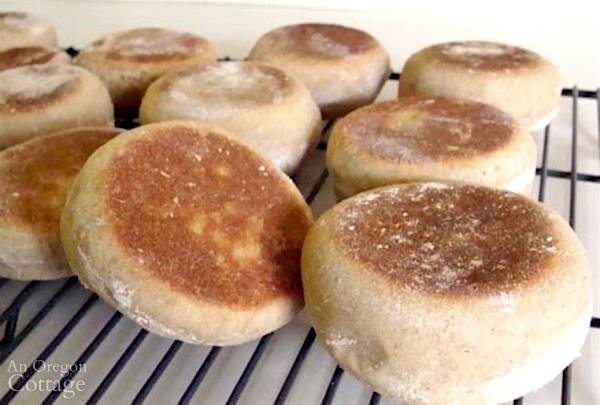 These English muffins were so easy to make and came out perfectly! I used a 2 3/4-inch round cookie cutter and ended up with 14 muffins. They are the perfect size—after letting them rise for 1.5 hours they were close to 3 1/4-inches in diameter. Next time I’m going to let the initial dough sit for a longer period of time in hopes that the sourdough flavor becomes more pronounced. This time I started the dough in the morning, so it had only 8 hours to rise. I’ll try 12 hours next time. 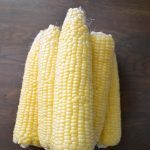 Great recipe—thank you for sharing it! 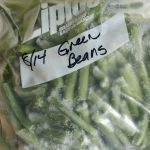 That size does sound perfect, Bethann – good idea about letting it ferment longer for flavor!